Atrial abnormalities are most easily seen in the inferior leads (II, III and aVF) and lead V1, as the P waves are most prominent in these leads. Atrial depolarisation proceeds sequentially from right to left, with the right atrium activated before the left atrium. The right and left atrial waveforms summate to form the P wave. 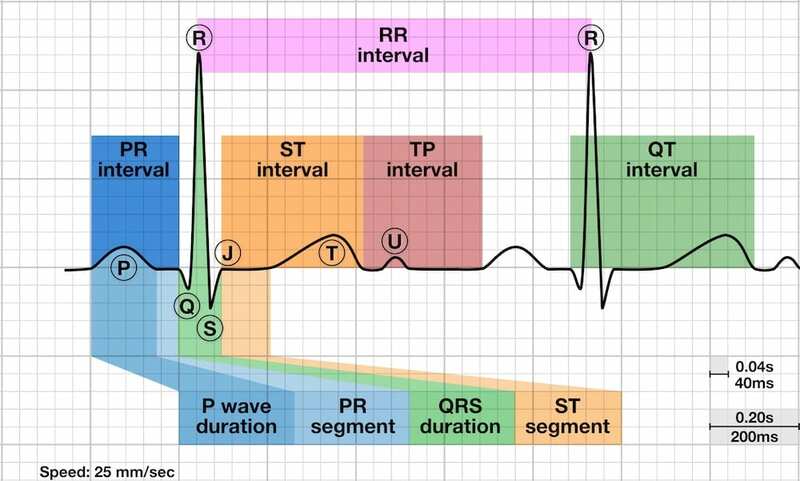 The first 1/3 of the P wave corresponds to right atrial activation, the final 1/3 corresponds to left atrial activation; the middle 1/3 is a combination of the two. In most leads (e.g. lead II), the right and left atrial waveforms move in the same direction, forming a monophasic P wave. However, in lead V1 the right and left atrial waveforms move in opposite directions. This produces a biphasic P wave with the initial positive deflection corresponding to right atrial activation and the subsequent negative deflection denoting left atrial activation. This separation of right and left atrial electrical forces in lead V1 means that abnormalities affecting each individual atrial waveform can be discerned in this lead. 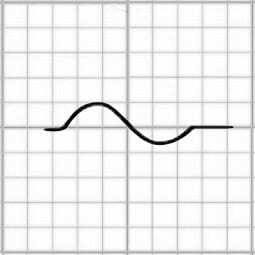 Elsewhere, the overall shape of the P wave is used to infer the atrial abnormality. 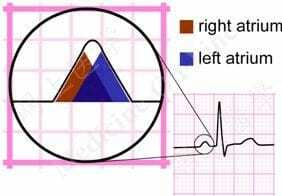 The right atrial depolarisation wave (brown) precedes that of the left atrium (blue). The combined depolarisation wave, the P wave, is less than 120 ms wide and less than 2.5 mm high. 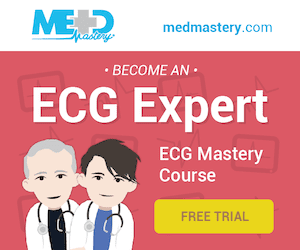 In right atrial enlargement, right atrial depolarisation lasts longer than normal and its waveform extends to the end of left atrial depolarisation. 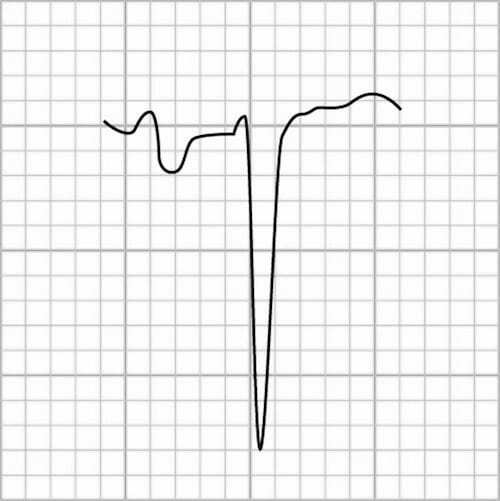 Although the amplitude of the right atrial depolarisation current remains unchanged, its peak now falls on top of that of the left atrial depolarisation wave. The combination of these two waveforms produces a P waves that is taller than normal (> 2.5 mm), although the width remains unchanged (< 120 ms). 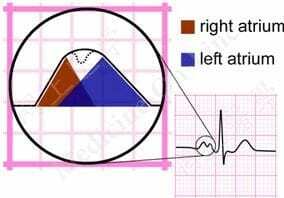 In left atrial enlargement, left atrial depolarisation lasts longer than normal but its amplitude remains unchanged. Therefore, the height of the resultant P wave remains within normal limits but its duration is longer than 120 ms.
A notch (broken line) near its peak may or may not be present (“P mitrale”). The P wave is typically biphasic in V1, with similar sizes of the positive and negative deflections. Right atrial enlargement causes increased height (> 1.5mm) in V1 of the initial positive deflection of the P wave. NB. This patient also has evidence of right ventricular hypertrophy. Left atrial enlargement causes widening (> 40ms wide) and deepening (> 1mm deep) in V1 of the terminal negative portion of the P wave. P mitrale (bifid P waves), seen with left atrial enlargement. P pulmonale (peaked P waves), seen with right atrial enlargement. 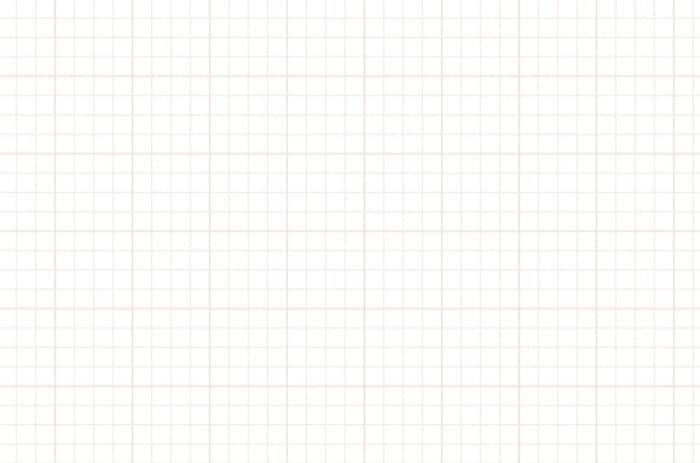 P wave inversion, seen with ectopic atrial and junctional rhythms. 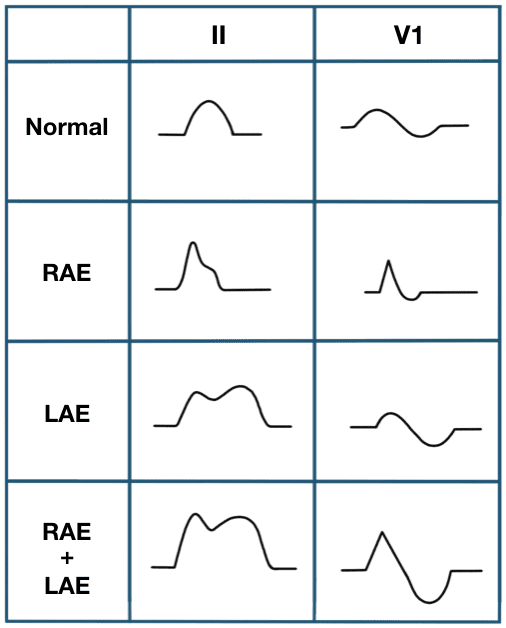 Variable P wave morphology, seen in multifocal atrial rhythms. The presence of broad, notched (bifid) P waves in lead II is a sign of left atrial enlargement, classically due to mitral stenosis. 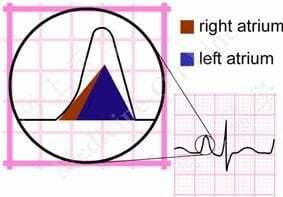 The presence of tall, peaked P waves in lead II is a sign of right atrial enlargement, usually due to pulmonary hypertension (e.g. cor pulmonale from chronic respiratory disease).